Multi-species angler. Love the stream and Great Lakes smallies, also the salmonids in Lake Michigan and especially harbor browns and stream steelhead. Lake Erie walleyes and perch as well. Working on an article for the next newsletter on fishing it in rivers. Started using it in 2012 in the pre-TRD days when we were gluing half ZinkerZ on mushroom heads. So versitile. Lots of ways to use it. Fun to experiment. The combination of the bouyancy and different delivery systems makes the only limit your imagination. Drop Shot, wood screw Nico rigs, swimming, whacky, bottom dragging, Trying it as a goby imitation for brown trout. I was at Cabela's right after they restocked in the spring. There were about 12 high school fishing team members filling their carts with TRDs. When they finished, like a plague of locusts, there was one pack of molting craw and two of bubble gum. Fun stuff. Very nice and compliments to Mike on one of the cleanest guide boats I have ever seen. Agreed, good for any gaged river in the continental US. I check it every time I fish a river. Has saved me a lot of useless driving. I&M Canal springs major leak. Glad to see action taken. From your posts it appears that a lot of people fish there. Glad they did something before a big fish kill happened. One extra tip that I thought of when I read Marks. The best way I found to teach them to set the hook is to have them hold the rod and hold their arm and the rod with your hands, setting the hook for them a few times. Speeds up the muscle memory a lot. John, your coverage of this has been fantastic. Bet the News Tribune would love using your excellent photos to cover this story. Maybe the paper changed names but I know they are the same org as the Wheaton paper, and they love having help in getting real news out. Using the press kept people honest in Wheaton and led to preservation of the Wheaton house. That is terrible. Is the Army Corps in charge of it? Thanks for the info, John. We will be going soon. That is great news. My wife and I are historic preservation people and love to see historic buildings saved and repurposed. Here in Wheaton, the home of Warren Wheaton, founder of the town, built in 1856, was going to be torn down and replaced with yet another Starbucks. Through a great deal of effort, including a letter to the CEO of Starbucks asking if he wanted his company known for tearing down historic landmarks, it was saved and is now a dental office. Thanks so much for the tour offer. Will definitely take you up on it the next time we are in the I.V. John, you made my day. My grandfather worked at Westcox from the late 30,s through the mid 70's. I was worried that especially after the never ending fire, they would tear it down. Glad to see it is being used and will definitely check it out. Thanks for the info. Back in those days, the local tavern was one of the social centers of society. A few of my early memories include having a coke with my dad, grandfather, or uncles at Essel's Tap in Lasalle , or Woodshanks or Johnny's Place in Peru. Now they would be calling DCFS if somebody took a little kid in a tavern. A better time, I think. We are the same age and my Grandfather lived on second street in Peru, right up the hill. I remember half gallon bottles of one of their brews at family events. Good times and good memories. I always loved visiting from the Quad Cities because my cousins could get Chicago stations. We had two tv stations in the QC. My cousins live in LaSalle, and one of their friends has a massive Star collection that dominates the whole house. You guys are all too young to remember Star Model and Star Union, brewed on Water Street in Peru on the banks of the then filthy, polluted and foaming Illinois River. I hope they did not brew it with river water, but according to my uncles, in addition to being cheap, it was bottled so "green " that it was widely known for it's laxative effects. I'm sure all the modern brews are great. Thanks for sharing. I have not. I did explore the area right before the Mazon goes into the Illinois. It gets narrow with a lot of twists and turns, then swampy. Definitely minimal wintering habitat. I have caught smallmouth around the rapids near Marsailles and near the remaining rocks from the demolished bridge in Peru. I should check out the river around Morris since that has to be where they go. Great information! On the migration issue, I really think fish do different things in different systems. I have a lot of experience on the Mazon, which has very limited access. On that stream, all of the bass winter in the Illinois . 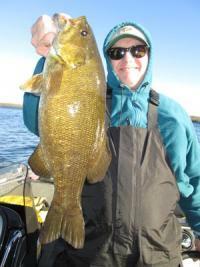 They migrate up usually in April, stay through spawning and go back down in October. I remember one warm fall I was fishing on Halloween. There were no bass in the normal summer spots, so I just kept wading downstream. The water was low and clear. Once I got to the deepest spot in that section , I found a hole that literally had hundreds of bass of all sizes in it. They were very inactive. Since the water was so clear, I could see pods of fish leaving as a group heading downstream. Just for fun I went back the next day and they were all gone.